Certainly near the top of the list of scientific instruments that have changed mankind’s view of the cosmos is NASA’s Wilkinson Microwave Anisotropy Probe (WMAP). In September 2010, the spacecraft fired its boosters for the last time and curved into a final orbit around the Sun where it will remain as a permanent fixture in the universe it helped to interpret. WMAP was launched on June 2001 to revolutionize the field of cosmology. WMAP studied the remnants of heat that lingered after the Big Bang, a pattern frozen in time from when the universe was only about 380,000 years old. The light arriving to WMAP from this great distance has since stretched to microwave wavelengths. Subtle differences observed in the texture of this so-called “cosmic microwave background” have revealed the geometry, composition and age of the universe. The probe showed that the universe is flat, and most likely endless. 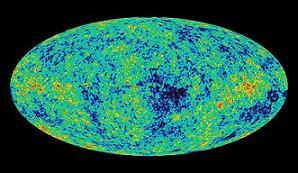 It also yielded the first full-sky map of the cosmic microwave background (see inset image). Other results included how this primeval light is polarized and forms the blueprint for the first galaxy formation. During its illustrious mission, WMAP science has been extremely fertile. Its findings produced some of the most highly cited papers in physics. And although WMAP science has come to a conclusion, its replacement is already in orbit: the European Space Agency’s Planck satellite. Listen to the before and after version here. Now that is one scientifically responsible artist!